The year is 1901, the literary sensation The Wonderful Wizard of Oz is taking New York City by storm, and everyone wonders where the next great book will come from. But to Annie Gallagher, stories are more than entertainment—they’re a sweet reminder of her storyteller father. After his death, Annie fled Ireland for the land of dreams, finding work at Hawkins House. But when a fellow boarder with something to hide is accused of misconduct and authorities threaten to shut down the boardinghouse, Annie fears she may lose her new friends, her housekeeping job . . . and her means of funding her dream: a memorial library to honor her father. Furthermore, the friendly postman shows a little too much interest in Annie—and in her father’s unpublished stories. In fact, he suspects these tales may hold a grand secret. Though the postman’s intentions seem pure, Annie wants to share her father’s stories on her own terms. Determined to prove herself, Annie must forge her own path to aid her friend and create the future she’s always envisioned . . . where dreams really do come true. 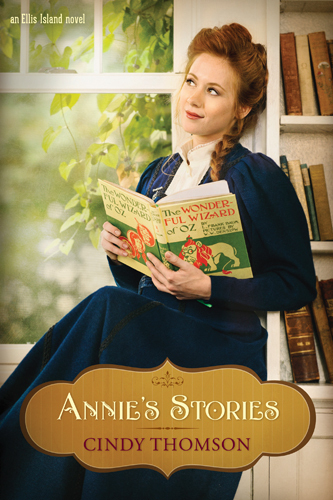 1) Tell us how you got the inspiration for Annie’s Stories.I knew I wanted to write a story about immigrants set at the turn of the twentieth century. When I looked to see what was new at that time, I discovered L. Frank Baum’s The Wonderful Wizard of Oz was published in 1900. Knowing what an impact that tale made and is still making, I knew I wanted to include it. I imagined that immigrants to New York City at the time, especially ones like Annie who came from rural Ireland, would have related to Dorothy Gale who was transported from Kansas to the odd and strange land of Oz. So I decided my character would read the book throughout the course of the story, and that she would love stories as the Irish do. 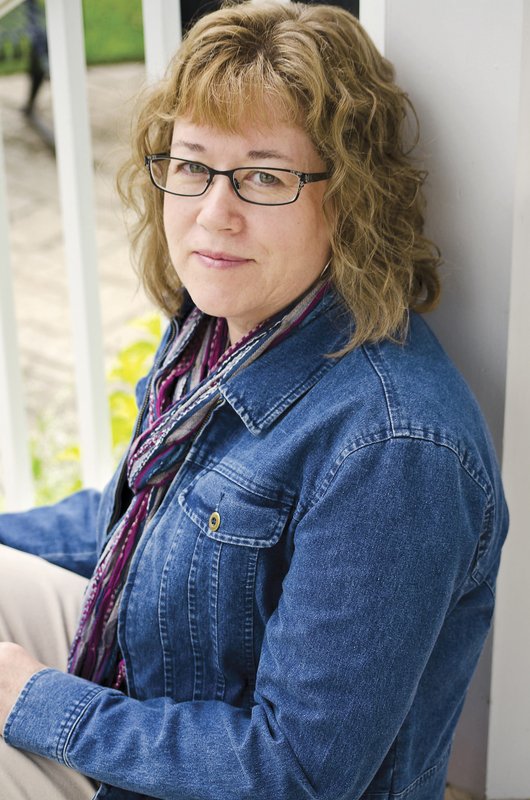 Tell us about yourself: Cindy Thomson is a writer and an avid genealogy enthusiast. Her love of history and her Scots-Irish heritage have inspired much of her writing, including her new Ellis Island series. Cindy is also the author of Brigid of Ireland and Celtic Wisdom: Treasures from Ireland. She combined her love of history and baseball to co-author the biography Three Finger: The Mordecai Brown Story, which was a finalist for the Society for American Baseball Research’s Larry Ritter Book Award. In addition to books, Cindy has written on a regular basis for numerous online and print publications and is a mentor for the Jerry B. Jenkins Christian Writers Guild. She is also a member of American Christian Fiction Writers and the Historical Novel Society. Cindy and her husband have three grown sons and live in central Ohio. Visit her online at www.cindyswriting.com. To be entered in a drawing to win a copy of Annie’s Stories, please answer this question: How do you define home? Should we follow the laws and our leaders? Offhand, I don’t recall ever reading the above passage in Scripture, but the pastor used it recently during a sermon. It’s not a passage that would stick with a person since we humans love to join different groups and affiliations. As America approaches another election year, it’s normal for people to side with the political group which best matches their personal and ethical convictions. I’m often at odds with fellow Christians because I agree with some, but not all, of a particular party’s platform. Yet this passage tells not to boast about following any particular human leader. That certainly goes against the tide, doesn’t it? We all want to strengthen the church’s influence on our beloved country, since America was founded on Christian principles. The more we remove God from the judicial and legislative branches governing our nation, the worse off our country becomes. In my opinion, God shone His grace on America when America worshiped and respected Him openly. Yet, something about politics today seems better designed to further political agendas and not God’s. In my recent book, The Quaker and the Rebel, my underlying theme is that both sides of the horrific Civil War worshiped the same God and felt that He was on their “side.” Both my hero and heroine grew up Quaker and retained some, but not all, their doctrinal beliefs. When the war broke out, which side you were on was determined by where you were born, whether you were rich or poor and of course, black or white. Considering the atrocities committed by both armies, God wouldn’t have been pleased with either. Of course slavery needed to end, and unfortunately it took a horrific war to abolish it. So shouldn’t we follow today’s leaders who best exemplify Christian principles? After all, we still have many injustices that need to be addressed in our society. Perhaps each Christian must decide how “political” they wish to be. For myself, I’m confused and easily led astray. I need to turn to Scripture and bend my head in prayer for my answers.